• And a Stick holder (seen in picture above). Currently there is no other information available at Simmonsdrums.net, GuitarCenter.com, or MusiciansFriend.com at the time of writing this article. • 10 trigger inputs (I’m assuming dual zone since the product page states compatible with single or multi-zone pads). • Multi-position Hi-Hi foot controller that gives you open, half-open, closed. (not quite full variable, but not bad for the price range). • SD card for external storage. (I would guess this is just for saving configuration/midi files and not for putting new sound in the module which would be the same function as on the Simmons SD9K module). info can be find here: Simmons SD1000 Additional Info! « Pearl Redbox V2 Firmware update! Just a few other things not clearly mentioned in the marketing. The module has a lot of new sounds. The drum sounds have alternating samples at each velocity with up to 4 way velocity dynamics. So there is no machine gunning on the samples. A lot of the kits were designed around well known, classic drummers kits. Also the patterns were updated to sound like some classic rock. 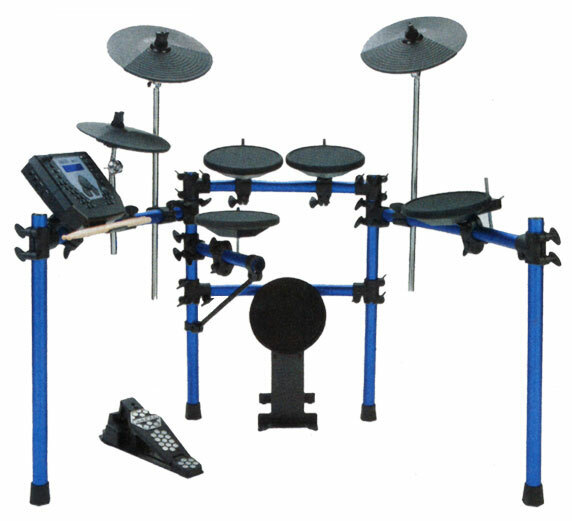 While this kit is no Roland contender it does stand up quite well the competition at it’s MAP price of $699. Also you can upgrade the ride to a triple zone from the dual zone 12″. You can add an extra ride and tom as well. Thanks for the extra info Jim! I don’t think any electronic drum set in that price range (other than the Simmons SD1000 of course) can do that. My ride cymbal was set-up right out of the box with the ride sound on the bow and a crash on the edge. Are you sure your cables are going to the correct trigger? Is your third tom actually set to the third tom sound? You should be able to assign any sound to any of the triggers. Maybe your ride cymbal isn’t working correctly. Have you tried plugging your other cymbal trigger into the ride cable? Just a thought. I hope that helps. Just bought this kit today and I’m happy so far. I ran it to my PC through USB but I’m getting no sound when I try to record with Audacity. I did a little searching through Google and came up with nothing so far. Is there something I’m missing? Keep in mind that the USB connection on the SD1000 is not used for audio. It is only for midi data. If you are wanting to record the audio from the module to your computer, you will need to use the two audio outputs on the back of the module connected to your mic/audio input on your computer. I hope that helps. Oh ok, great. I appreciate the input. I’ll get the right cable to use the audio outputs instead. I’ve an oldie/newbie (played in High school 30 years ago, ouch) and purchased the set about a month ago. Fairly happy with it with one exception… I really don’t like the hi-hat controller (stiff, clunky). Can you adjust it in any way (I’m afraid…) Would an upgraded controller (like Roland) work with it? On that same thought, could a Roland mesh snare pad work with it also? Lots of great sounds! Thanks! Don’t know of any other hi-hat controller that would work. I tried an Alesis and Roland and neither one of those are compatible. There is a slim chance that a Yamaha hi-hat controller might work. I’m only saying that because I know the Yamaha hi-hat controller works with another Simmons product, the SDMP1 multi-pad drum machine. I have no way of finding out. If you decide to try it, make sure where ever you purchase it from has a good return policy. I hope that helps. MY ride cymbal and crash two don’t work, when i first got it the ride had zones to have it play as a ride and loud crash, now it just makes just the ride noise, that is ONLY if i hit it n the right spot. I tested one of the cymbals with the same chord and it works fine. Therefore after only have this for two weeks, two of my cymbals dont function correctly if at all. Help? You need to contact Simmons or the place where you purchased your kit. Other than that I can’t help you. I was wondering if a Roland mesh pad cold be used in place of the snare on this kit? I have no Roland mesh pad to try. I would say you can, but you will not get 100% compatibility out of it. That’s because the Roland mesh pads tend to be piezo/piezo sensors and the Simmons are set up for piezo/switch. I’m also not sure just how well it would trigger since the pad designs are different between the two. Just recently bought Simmons SD1000 electronic kit and after setting everything up, it seems that theres some serious cross-wiring problems. When i hit the rims of any pad, its registering that I’m hitting 3-4 different pads. (when i hit the hi-hat, the crash and floor tom is also sounding.) Also, the module screen isnt lighting up but if I apply some pressure to the face it lights up and when I stop, it goes out again. Please help as I am not happy with the fact I just spent this much money on a kit that is unplayable. Did you buy the kit new? If so, you need to return it, because it sounds as if you have a bad module. It shouldn’t act like that when you set it up. If you bought it used, I’m not sure what to tell you. You can try to reset the module to factory defaults. I don’t have the manual in front of me, but the procedure should be in there. One of my cymbals has gone out on me and doesn’t register hits a majority of the time. I plugged it up to a different output with the same results. So it needs to be replaced. Am I stuck using one of the Simmons model replacements, or can I source another one that won’t cost me $80? Don’t know how long you have had the kit, but you might want to contact Simmons. If its still under warranty, they might replace it for free. Other than that, the most cost effective edrums on the market right now are Simmons. Your not going to find much cheaper than that, unless you try to make your own “DIY cymbal trigger”. Google that if you are interested. Yes I still have this kit, but I don’t use it exclusively anymore. Nothing wrong with it except two of the plastic wing nut tops broke off. Not a big deal since the tops of the wing nut (under the plastic) is actually a standard square drum tension rod top (just use your drum key to tighten it up). I have since upgraded to the SD1500 kit which has a much nicer hex metal rack and metal clamps and a much more stable kick tower. I haven’t had any issues with my SD1500 kit at all. I have the upgraded sd1500 and have been playing it for over a year without problems. I love the set. People always ask what other pads cam I get that would work with the sd1000 module. The answer is simple, only Simmons pads designed for the sd1000 or sd1500 will work properly. What would be awesome if Simmons came out with compatible mesh head pads. Follow up of: Hack For A Drum Module?